Please join us to celebrate and honor this year’s recipient of the Scientific and Cultural Facilities District’s Rex Morgan Award on November 30, 2010. Floyd Ciruli’s extensive cultural leadership dates back to the formation of the SCFD. Mr. Ciruli was instrumental during the cultural district’s reauthorization elections and throughout its 22-year history. His ongoing knowledge, guidance and dedication to the SCFD family makes him a most appropriate recipient of this award. An SCFD tradition since 1998, this award annually honors a resident whose sustained leadership contributions have significantly benefited the cultural community in the seven-county district. Recipients demonstrate characteristics exhibited by Rex Morgan, one of the SCFD’s founders. Mr. Morgan’s efforts and knowledge of the legislative process helped create the SCFD as a source of public funding for the Denver metropolitan area’s cultural attractions to ensure a legacy of cultural experiences to benefit its citizens. The SCFD is recognized as one of the nation’s premier arts, culture and scientific funding organizations. Established in 1988 by the voters of the Denver Metro area it today annually provides $37 million for more than 300 local arts organizations creating a foundation for Colorado’s superior quality of life, cultural prosperity and broad citizen access. 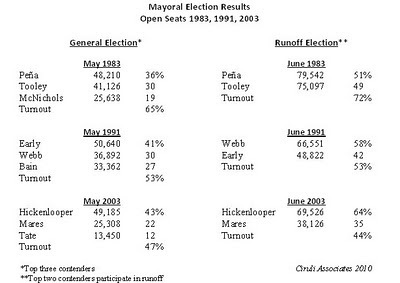 Since the 1980s, Denver’s mayoral elections have produced s series of surprise winners. Federico Peña in 1983 (Dale Tooley and William McNichols were frontrunners), Wellington Webb in 1991 (Norm Early was frontrunner), and John Hickenlooper in 2003 (Ari Zavaras was frontrunner). In the classic upset 20 years ago, Norm Early, the popular Denver DA with a substantial war chest and much of the establishment’s support, won the first round with 40 percent, but lost the runoff to Auditor Wellington Webb by 16 points, or 18,000 votes. After a difficult re-election, Webb went on to be a popular three-term mayor. Hickenlooper won his first election over City Auditor Don Mares by an extraordinary 31,000 votes, or 29 percentage points. When John Hickenlooper won his mayoral election in 2003 with 64 percent of the vote, the economy was the main issue on voters’ minds. Hickenlooper’s business background and non-partisan image was the right fit for an election concerned about balancing budgets and finding jobs. Hickenlooper’s experience as an economic development advocate and budget balancer helped in his latest campaign and should serve him well as governor. Next year’s Denver mayoral election will likely attract a host of candidates, and the economy and budget cuts will again be the major topics. The last poll conducted for 9News/Denver Post two weeks before the 2003 Denver election had Hickenlooper in the lead with City Auditor Don Mares in second. Nearly one-third of the voters were undecided, and on Election Day, Penfield Tate came in third. Hickenlooper and Mares went on to the runoff. 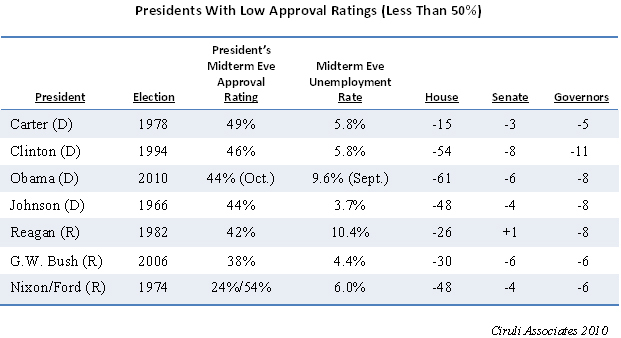 The nationalization of the midterm election was a main topic of a presentation of City Club of Denver on November 16. A Republican wave swept across the country and helped elect sixty-one new Republican congresspersons, including two from Colorado. Republicans needed 39 seats to take the House of Representatives and ten in the Senate. They won six new Senate seats, but failed in Colorado. 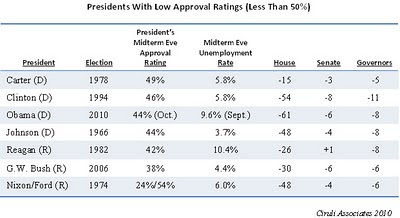 Republican midterm gains were the largest won by a party since 1938 and they are at their highest number of congresspersons since 1948. Democrats just took control of the House in 2006, winning 30 House seats. The last huge national wave was 1994 when Republicans won 54 seats, taking the House for the first time in 40 years. In the west, Republicans won congressional seats in Arizona (2), Colorado (2), Idaho (1), Nevada (1), New Mexico (1) and Washington (1). Due to California’s political gerrymandering and substantial Democratic vote, no seat changed party control. PBS provided ongoing coverage of the midterm election, and Colorado was one of their featured states. Gwen Ifill used the senate race as a lead story just prior to the August 10 primary and revisited it in late October. The timing of the interview was auspices because the senate race had tightened according to published polls. Her questions covered the advertising, the money and the get-out-the-vote – all the key elements in the final decision, which was not called until early Wednesday morning. After half a decade of ascendance, the Colorado Democratic Party was brought to earth by a national storm of anger at Washington D.C. Colorado voters put Republicans in charge of a host of congressional, statewide constitutional offices and legislative seats. But, they affirmed their ticket-splitting independence and that character, positions on the issues and campaigns matter by electing Democrats to the state’s two top offices. Like the truncated administration of Bill Ritter, Hickenlooper faces similar challenges moving into state government. • He has only secondhand knowledge of state government and the legislature. Selecting his legislative team and alliances with major lobbyists is key. • Colorado governors have much less power than Denver mayors. Fortunately, Hickenlooper knows how to use the bully pulpit to push his agenda. • The capital press corp is much more aggressive and longer serving than the frequently changing Denver City Hall reporters. Hickenlooper will need to develop a thick skin. • Special interests in the capitol are represented by an army of lobbyists who also tend to run political campaigns and are often associated with their preferred parties and legislative blocs. How to say no and yet not make enemies is a talent hard to cultivate. • Ritter was often blindsided by his nominal legislative allies serving some interest group or party purpose. Having lost the House, Hickenlooper likely avoids that problem, but House Republicans will be interested in building their majority and quickly testing if Hickenlooper might become the second one-term governor in Colorado’s recent history. Historically, K-12 education in Colorado has been at or near the top of most lists of well-thought of local government entities. In polls rating the favorability of local government organizations, school districts are nearly always ahead of municipalities and counties and just behind libraries. But, recent polls show local schools have dropped dramatically in public esteem. For example, one of the best thought of school districts in Colorado – Douglas County – dropped from second from the top to second from the bottom in two polls conducted in the county in 2003 and this year. Partially, the shift reflects the weak economy and anger with government, which appears to be dragging down all governments’ favorability ratings. Schools, of course, have faced their first budget cuts in recent history, angering some parents and school supporters. But, a growing factor is the school reform movement. It recently brought 800 people to a lunch for Davis Guggenheim, the director of “Waiting for Superman,” the new documentary on failing schools and one reform option – charter schools. Many people are growing increasingly impatient with the pace of school improvements as measured by high dropout rates and low test scores. Gallup’s recent annual poll on the public school system, which is typically very favorable to public schools, shows that while local schools tend to receive A’s and B’s from about one-half the public, only 18 percent give A’s and B’s to “the nation’s public schools” and 53 percent give them a C.